When will be Our Guy in China next episode air date? Is Our Guy in China renewed or cancelled? Where to countdown Our Guy in China air dates? Is Our Guy in China worth watching? Guy Martin's love of industry and endeavour leads him to China, a country recognised for its innovation, technological development and gigantic manufacturing. His eclectic interests provide the guidebook as he reveals the unseen side of China's outstanding achievements. Guy's adventure starts in Chongqing, the fastest growing city in the world, where he works in a factory to build his own electric motorbike. He's surprised by the lack of automation - everything's assembled by a skilled workforce - and realises that it's symbolic of the wider Chinese economy, where 30 years of unprecedented growth have been sustained by a giant workforce. At the city's docks, he meets the 'Bang Bang Army', a group of ageing porters who rely on immense brute strength to haul huge loads. Guy's keen to lend a hand but can't shift the 200kg load without falling over, much to the amusement of the experienced Bang Bangs. His next stop is the world's biggest public convenience. Guy Martin explores Beijing, ignoring the tourist traps and following his own often eccentric passions as he reveals a lesser-seen side of China. In a backstreet bicycle shop he spends ú18 on a rudimentary 'Flying Pigeon', the most produced machine in the world. Under the reign of Chairman Mao it was the only approved mode of transport for workers, with some 500 million built. Guy meets families who live on a scrapyard, earning a living by processing old cars. He's pleasantly surprised by the yard's efficiency and cleanliness, and spending the afternoon helping out by operating the cranes and machinery is Guy's idea of the perfect holiday. Inequality is a huge problem in China, with one per cent of the nation controlling half the wealth. 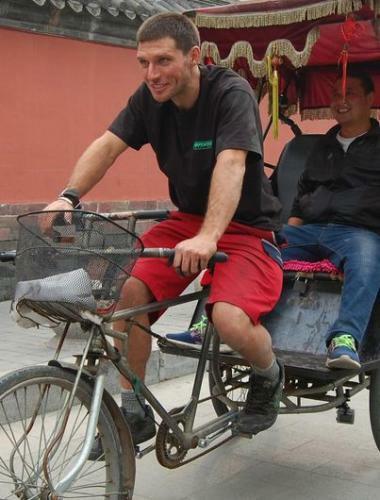 Guy Martin concludes his Chinese adventure with his toughest ever physical challenge. He wants to break the record for the fastest crossing of the Taklamakan Desert on a bicycle. The Taklamakan is known as the desert of death because of summer temperatures that average 40C, sand storm winds that can reach 150mph, and the local legend that once you enter the desert you never come out. Guy must travel 341 miles along the world's longest desert highway in less than 47 hours, a record set in 2014 by two keen British cyclists who only stopped once for a four-hour sleep on a sand dune. They described it as the worst two days of their lives. It's a mental challenge as well as a physical one. In the desert's cold morning air, the metal in Guy's bones aches, a legacy from his motorcycle injuries. Old lorries spurting out thick black fumes constantly thunder past him and pose the biggest threat as the sun sets on the unlit road. Our Guy in China next episode air date provides TVMaze for you. EpisoDate.com is your TV show guide to Countdown Our Guy in China Episode Air Dates and to stay in touch with Our Guy in China next episode Air Date and your others favorite TV Shows. Add the shows you like to a "Watchlist" and let the site take it from there.